Ministry at Bethel is done by all its members! Everyone – from young children through senior adults – is encouraged to become a fully committed follower of Jesus Christ. 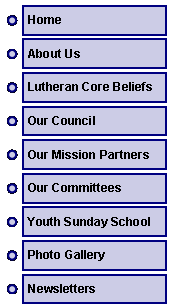 Our committee structure is designed to help each person grow closer in their relationship to God. We invite everyone to use their talents and gifts to serve and give glory to God! Strives to facilitate an encounter with the Triune God through planning meaningful liturgy and music for the weekly assembly of God’s people. Worship planning is aimed at being Spirit-filled, Christ-centered, and mission-oriented by following the basic format – gathering, word, meal (holy communion) and sending. The committee schedules and trains the various worship servants - prayer leaders, scripture readers (lectors), communion assistants, ushers, communion bread bakers, and mail greeters who all participate in leading the worship service. Strives to promote the Christian life as one in which all of life is lived in response to God’s grace. Encourages each Bethel member to develop the gifts God has given them, to use their time in service to God, and share of their financial resources. For more information, please contact Ruth Brewer. Strives to insure proper maintenance and protection of all property of the congregation. Also leads efforts for enhancing and modifying the space provided so that God’s presence is made known in all functions that take place within the church building and on property grounds – worship, fellowship, learning, and outreach. For more information, please contact Don Linn. Strives to facilitate opportunities for members to grow deeper in relationship with their Christian brothers and sisters. Baptisms, confirmations, and reception of new members are celebrated; congregational meals are planned for mid-week Lenten services, church picnics, and other significant events in the life of the congregation. Strives to promote and encourage all to be evangelists, witnesses of the good news in Jesus Christ in their daily living. Engages the congregation in various community outreach programs, all aimed at making Christ’s presence known in the Portville community and beyond. Strives to provide educational opportunities for God’s children of all ages to understand what being a baptized child of God means to them. Oversees the learning that takes place through traditional means such as Sunday School, confirmation classes, and adult forums, as well as planning more experiential learning through retreats and special small group studies. For more information, please contact Terri Ploetz. For more information, please contact Doug Ploetz.